After judging 355 home brews that were sent in from across Canada I am very happy to announce that Ian Morrish Walked away with the title of Yeast Wrangler of the Year. Ian earned the title by way of 6 medals, 2 gold, 3 silver and one Bronze. 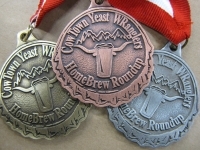 Other medal winning Vineyard customers included Jermey Cowan, runner up Yeast Wrangler of the year with 6 medals (1 gold, 2 silver, 3 bronze), Dakota Paul with 4 (3 bronze and a silver), Chris Heier with 4 (3 bronze and a gold). Greg Josiak, Kevin Hanson, pulled off 2 medal wins. Jordan Ramey, Michal Foniok, Carlo Cusulin, Matt Lowe, Sean Borchert, Paul De Guise, and Brad Tuckwood all walked away with single medal wins. The Vineyards own Beer Geek managed to pull down 4 medals and be declared the 2nd runner up Yeast Wrangler of the Year for 2012. Of note on this win is that that Neil won all 3 available medals in the Meads and Ciders category. Click here to see all the winners. The Vineyard is very proud to have so many of its customers do so well in such a prestigious competition. The Cowtown Yeast Wranglers Annual Homebrew Round Up is the first leg of the Canadian Homebrewer of the Year title. This year there are 6 competitions to determine Canada's best homebrewers. The next leg in the competition circuit is Lethbridge in late March. The Vineyard is a proud sponsor of The Lethbridge Werthogs competition and we look forward to having our customers participating and winning more medals. The Beer Geek would like to extend a personal thanks to all the judges, stewards and organizational staff for making this the largest and most successful Round Up to date. Judges flew and drove in from as far away as Winnipeg, Edmonton and Abbotsford BC. Thanks to the Professional Brewers and BJCP certified brewers that took time out of their busy schedules in order to make this years contest the most successful one todate.